The ancient Phoenicians were great traders and sea farers, but they tended to overload their boats. In stormy weather, goods had to be thrown overboard in order to save the ship. Owners of lost goods were then compensated by those who did not lose their goods, and the amounts involved depended on the total value of the goods. This arrangement was named havara, and this term evolved over the centuries to become average, and from average the mathematical term mean developed. The astronomer, Gauss, measured distances between stars. He noticed that it was difficult to reproduce his measurements exactly. However, the measurements clustered around a central value, more common near the mean, and becoming less common as they are further away from the mean (fig. left). He concluded that any set of measurements would normally distribute to this pattern and called it the Normal Distribution. De Moivre derived the formula for the Normal Distribution curve in mathematical terms (fig. right). Once this was done, the features of Normal Distribution could be mathematically handled. Using simple calculus, the area under the curve (or any part of it) can be estimated. Fisher developed the concept further and used the area under the curve as a measure of probability. He argues that if the area under the whole curve be consider totality, then any portion represents the probability of the events that describe the portion. From this, he was able to calculate the probability of obtaining a measurement that exceeds a deviation from the mean value. He standardized the measurement of this deviation and called it the Normal Standard Deviate (z), later abbreviated to Standard Deviation, and derived the relationships between z and probability. The Standard Deviation z and its probability are the basis of many statistical calculations, including differences between groups and sample size estimations. However these calculations are often embedded into computer programs and are not visible. A few z values are however much more commonly used, the most frequent one being the z value of 1.96, as the probability of having a value exceeding this is 0.025 (2.5%), so that 95% confidence intervals in any Normally distributed measurement is mean ± 1.96 SDs. 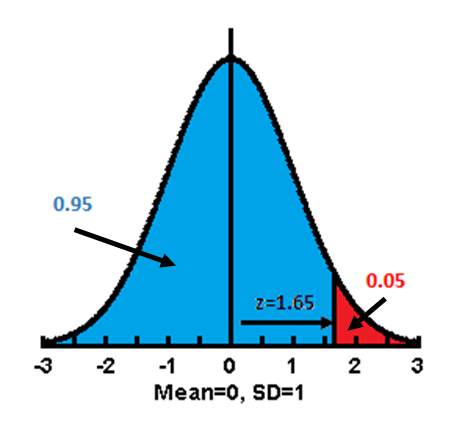 We understand that, for the IQ, the population mean is 100 and the Standard Deviation is 10. What is the proportion of the population that has an IQ of 120 or more. The answer is as follows. The IQ 120 is 20 points (2 Standard Deviations) above the mean, and the probability of z>=2 is 0.023, so 2.3%. In other words, an IQ of 120 is 97.7 percentile. If population mean and SD for IQ is 100 and 10, what IQ levels can be considered abnormal. The argument is as follows. If we accept normality as the range within which 95% of the population can be found, then abnormal values must be the 5% outside of this range. Assuming a symmetrical normal distribution, this means 2.5% on each side of the normal distribution curve. As the z value for p=0.025 is 1.96, then those with IQ 1.96 SD less than the mean (100 - 1.96*10 = 100 - 19.6 = 80.4) can be considered subnormal at 2.5 percentile, and those with IQ 1.96 SD more than the mean (100 + 1.96*10 = 100 + 19.6 = 119.6) can be considered supernormal at 97.5 percentile. Please be reminded that, although probabilities of z are presented to 5 decimal points of precision in the table, only a 2-4 decimal point precisions are more commonly used.